Jetpack is required plugin for Cell WordPress theme. Jetpack is comprehensive and free plugin by WordPress.com which provides several features under one roof. You need to install and activate the Jetpack plugin in order to use the supported modules. 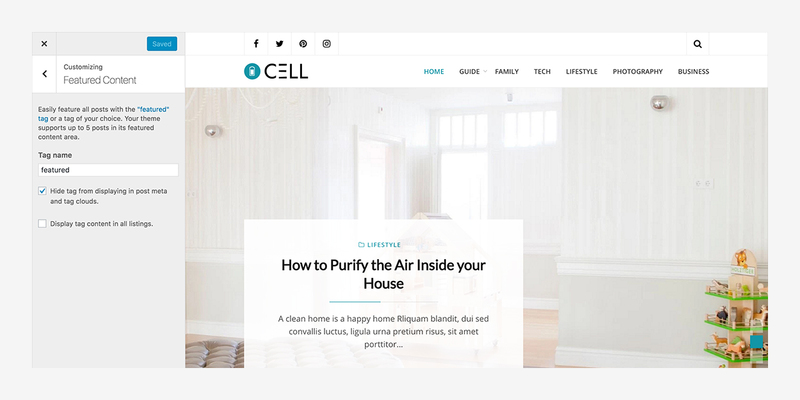 Cell includes an eye-catching featured content area on the home page. Capture your visitors’ attention and lead them to specific posts or pages. Go to Customizer → Featured Content and add the featured tag, or a tag of your choice. Cell supports five posts or pages in its featured content area. You’ll find Cell’s theme options in the Customizer, under Customizer → Theme Options. You’ll find Cell’s general options in the Customizer, under Customizer → Theme Options → General Options. Use Cell‘s wide style or personalize it with beautiful backgrounds using the boxed style. Cell will cover the full screen width in wide-layout mode. Any background color or background image will not be visible using wide-layout mode. Cell will wrap the content in a box. This option is best if you want to use a background color or background image for your website. Cell displays the main sidebar on the right or left side, as long as it contains widgets. You can choose to make the header custom menu sticky, so visitors can always access the menu while they scroll down the screen. This option can be enabled via the “Enable Sticky Menu” option. You can make the Cell‘s sidebar sticky by enabling this option. This useful feature ensures that the sidebar remains visible while the user scrolls down to read long content. You can control the appearance of Site Hero on the single blog post of all post types e.g. portfolio, testimonial etc via this option. You can control the appearance of Site Hero on the single blog post of standard ‘post’ post type via this option. You can control the appearance of Site Hero on the single blog page of standard ‘page’ post type via this option. You can control the display of author name via this option. You’ll find Cell’s skin options in the Customizer, under Customizer → Theme Options → Skin Options. Use Cell‘s primary color to personalize it with your favorite color. Use Cell‘s secondary color to personalize it with your favorite font. You’ll find Cell’s headings fonts options in the Customizer, under Customizer → Theme Options → Headings Fonts Options. You’ll find Cell’s body fonts options in the Customizer, under Customizer → Theme Options → Body Fonts Options. You’ll find Cell’s menu fonts options in the Customizer, under Customizer → Theme Options → Menu Fonts Options. You’ll find Cell’s ads options in the Customizer, under Customizer → Theme Options → Ads Options. You’ll find Cell’s WooCommerce options in the Customizer, under Customizer → Theme Options → WooCommerce Options. You’ll find Cell’s Footer options in the Customizer, under Customizer → Theme Options → Footer Options. You’ll find Cell’s Utility options in the Customizer, under Customizer → Theme Options → Utility Options. Cell supports Featured Images on blog posts and pages. They appear near the title on the blog index and archive pages. For best results, use an image at least 1920px wide and 600px high. 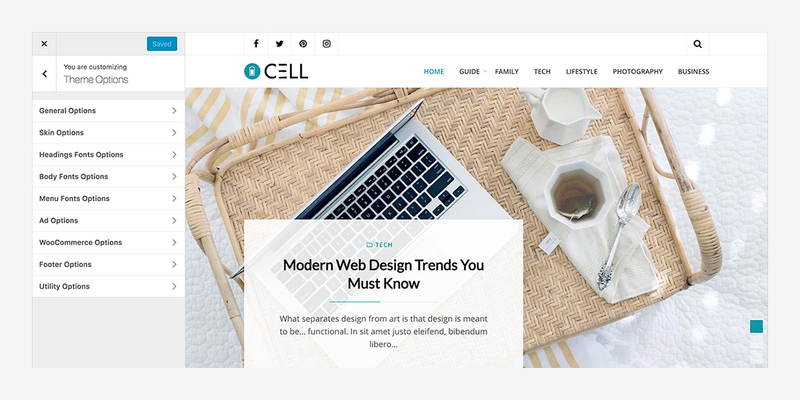 Cell has several built-in typography features to enhance your blogging experience. Please visit the links in order to know how to use them. Cell has given special attention on blockquotes to enhance your blogging experience. Please visit the links in order to know how to use them. Cell supports lists and code professionally to enhance your blogging experience. Please visit the links in order to know how to use them. Cell has different style of tables in order to enhance your blogging experience. Please visit the links in order to know how to use them. Cell has different style of buttons in order to enhance your blogging experience. Please visit the links in order to know how to use them. Cell supports modern feature of CSS3 Multiple Columns in order to enhance your blogging experience. Please visit the links in order to know how to use them. Add a Custom Header image by going to Customizer → Header. Your uploaded image should be at least 150px tall. The width should be at least 1920px to provide a visually crisp background. Cell allows you to have two Custom Menus, which can be set under Customizer → Menus. Cell allows you to display links to your social media profiles — like Twitter and Facebook — as icons using a Social Links Menu in two locations. Cell comes with five widget areas: one in the sidebar, one in the footer area full width for Instagram feed and up to three in the footer. The footer widget areas will activate once you add widgets to them in Customizer → Widgets. The Instagram widget displays Instagram images on the top of footer widgets. Go to Customizer → Widgets to use the Cell: Instagram widget. The Post Carousel widget displays the posts in a rotating slideshow with Featured Images. Go to Customizer → Widgets to use the Cell: Post Carousel widget. The Post List widget displays posts alongside a small Featured Image. Go to Customizer → Widgets to use the Cell: Post List widget.